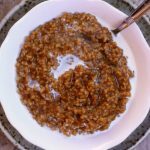 Slow Cooker Pumpkin Pie Steel Cut Oatmeal–hearty steel cut oats are cooked with pumpkin puree and pumpkin pie spice slowly in your crockpot to make a comforting breakfast perfect for a chilly fall morning. If you’re not familiar with steel cut oatmeal you need to be! It is my favorite and I don’t make it near enough. This type of oatmeal is processed by cutting the whole oat groat into pieces instead of rolling it (like rolled oats). It almost looks like a grain of rice that’s been cut into pieces. Because it’s cylindrical in shape it takes a while to cook, much longer than rolled oats. It has a chewy texture that retains much of its shape even after cooking. Pumpkin spice lovers will rejoice to add another pumpkin recipe to their repertoire. And you can feel good about that fact that this oatmeal will stick to your ribs and keep you full until lunch. 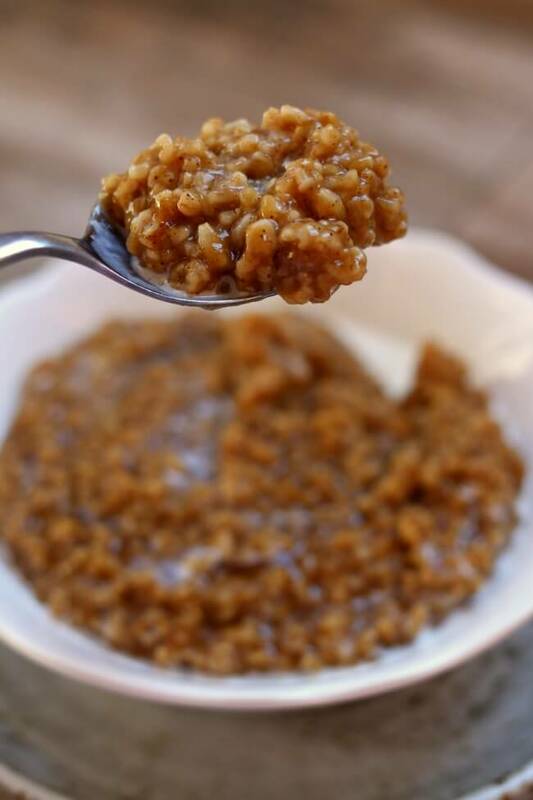 My kids and my husband were skeptical to try this oatmeal but ended up loving it. To make Slow Cooker Pumpkin Pie Steel Cut Oatmeal I used my 6 quart oval Kitchenaid slow cooker. * I love this slow cooker. It cooks low and evenly. I love the medium heat choice because most slow cookers that I’ve seen only have the option of cooking on low or high. If you’re going to buy just one slow cooker, this is the one that I recommend. 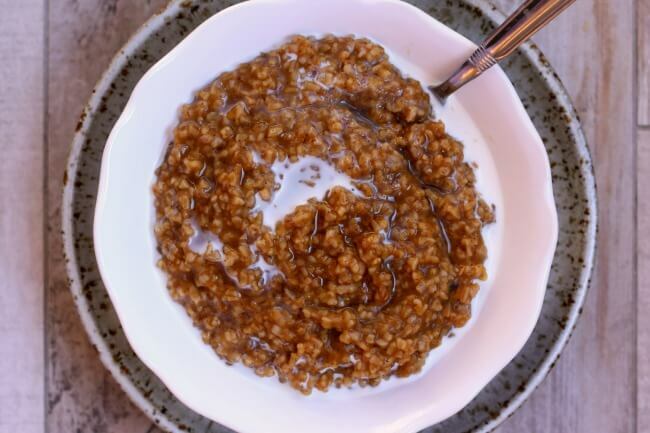 Hearty steel cut oats are cooked with pumpkin puree and pumpkin pie spice slowly in your crockpot to make a comforting breakfast perfect for a chilly fall morning. Stir all ingredients into your slow cooker. Cover and cook until oats are softened and thickened, 4-6 hours on low. Let oatmeal sit for 10 minutes. Stir and serve. This keeps well in the fridge for at least 3-4 days. Store in an airtight container. 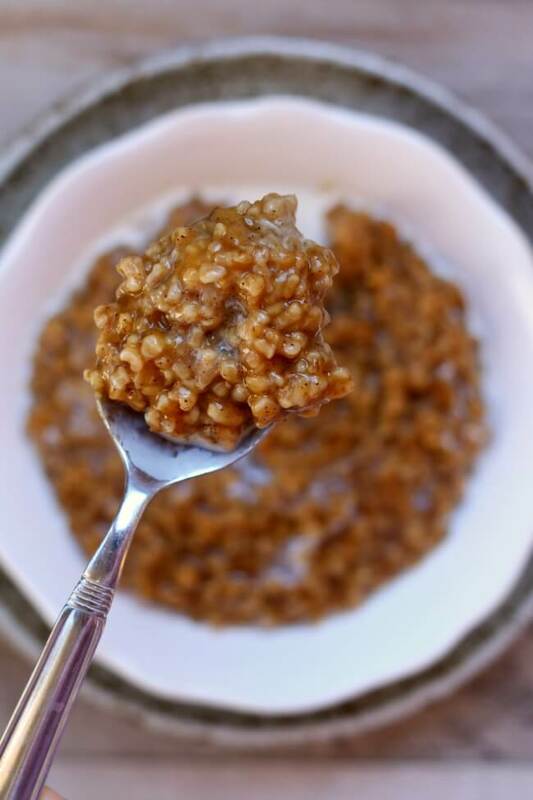 Like this recipe for Slow Cooker Pumpkin Pie Steel Cut Oatmeal? Get all my new recipes delivered to your email inbox by signing up below.